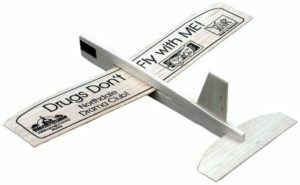 Add an element of summer fun to any event with promotional airplanes by custom printing your name or message on these fun promotional give-a-ways. Print your custom message on heavy cardstock Penny Paper Airplanes for an inexpensive and fun way to promote your business. Or print your logo and advertise on our Balsa Wood Gliders. Children and adults alike enjoy Promotional Airplanes which can be flown indoors or outdoors. Glider Airplane shaped in a classic, smooth flying glider form. DC-10 Jet allowing for easy assembly of wings and tail section. Traditional Fold are shaped like the classic paper airplanes. Elliptic Airplanes are ideal for the travel or airplane enthusiast. Military Plane style allows for many hours of fun, promotional use. Perfectly proportioned 8″ Balsa Gliders have a design for maximum fly-ability. All parts are smoothly machined with no die-cut parts. Best selling Balsa Glider! 9″ Gliders offer sleek “air superiority” with printed tail surfaces and pilot canopy allowing you to easily loop and soar. 12″ Balsa Glider is a super smooth flying glider with the lines of a high flying soaring plane. Best flying Balsa Glider! Wooden Motor Plane with 12″ wing span are complete with a durable propeller and elastic motor. You will have the most fun with these Wooden Motor Planes! Stock designs are also available to simplify the design of your Balsa Glider.